As some of you might have gathered by now, there is a monthly blog challenge for the Best of British created and supported by The Face of New World Appliances. Each month, a different region or county within the UK is featured and the challenge is to make either a dish from that area or using ingredients that come from it. I’m keen to support this as it is very much about promoting British produce AND I did kick things off with the Best of British Cornwall back in May. There is also an incentive of a possible £50 Amazon voucher for one lucky entrant. Janice of Farmergirl Kitchen hosted a Scottish challenge in June and the current one, for Yorkshire is hosted by the exuberant and energetic Karen from Lavender and Lovage. Now, since trying my first (and only) Yorkshire curd tart when I was in York last year – from the famous Betty’s Tea Rooms no less – I’ve been wanting to try my hand at making them myself. Needless to say, it took this challenge to get me kick started. A couple of nights ago a group of us went to see No Fit State, an amazing animal free circus that is performing at the Eden Project throughout August. We were all meeting up for a picnic beforehand, which seemed like a perfect opportunity to try out the tarts. Of course, these were my interpretation of this classic recipe – I had to get chocolate in somehow! I based the filling on this Hairy Bikers recipe. The night before, brought 2 pints of milk to a simmer. Squeezed in the juice of a lemon and left the milk to cool down, stirring very briefly. Poured the mixture into a sieve lined with a cheesecloth and left overnight for the whey to drip out. Placed 150g of wholemeal flour in a bowl with 25g cocoa powder and 15g icing sugar. Added 100g of cold cubed unsalted butter and rubbed the mixture between my fingers until it resembled breadcrumbs. Threw in an egg yolk and a splash of cold water. Stirred and brought the mixture together into a ball. Placed in a plastic bag and put in the fridge for a couple of hours. Creamed 65g of unsalted butter with 65g cardamom (caster) sugar until very light and fluffy. Grated in the zest of an organic lemon and creamed some more. Beat in an egg until thoroughly combined. Stirred in the curd cheese. Added 25g of raisins (would have used current, but didn’t have any). Rolled out the chilled pastry and cut into rounds to fill four 9cm tart cases and 7 jam tart sized dimensions – I used my muffin moulds. Divided the mixture between the tarts and baked at 180C – 20 minutes for the larger tarts and 13 minutes for the smaller ones. The tarts were delicious, just as good as I remembered the one from Betty’s Tea Rooms. The chocolate pastry offset the sweetness of the filling and the overall effect was very satisfying – certainly everyone seemed to enjoy them. We picnicked in the evening sunshine, a rare event this summer. We then enjoyed a fabulous performance of flying trapezes, rope climbing, hula hoops, trampolining, contortionism and pole dancing like you’ve never seen before. Oh and the music was good too. How interesting Liz, I’ve never heard of using epsom salts in cheese making before. I’ve not tried buying curds either, so I’ve no idea how hard they are to acquire. I can see ground almonds would work really well. So did your grandmother pass on her excellent curd making skills to you? Great entry for BoB, love your chocolate twist on a very traditional recipe. They look so good! I’ve heard of Yorkshire curd tarts, but I’ve never tried one. With your cheese making skills, making curds would be a cinch for you. They are so worth trying. Thanks Karen – yes I forgot the wee dram! Next time, although Phil reckons rum might be better!!! Utterly lush pastries. I think I will join you in with the challenge, just need to do a blog post. I’m tempted now to make the curd tarts like yours. I love yorkshire curd tarts, my mother is from Yorkshire and she makes them really well! There should be a statue put up in honour of curd tarts (maybe there already is one in Yorkshire) – it’s such a good dish. I like the choc pastry idea a lot. I know that you can add brandy but my favourite is a drop or two of rum. You and Karen between you are determined to lead me astray! Think I’m with you on the statue, can’t believe I’ve discovered them so late in life. 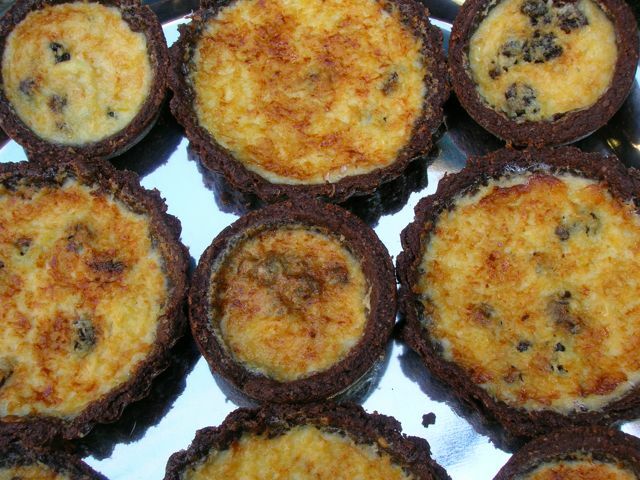 Oh, some more wonderful curd tarts … and with chocolate pastry … that was to be expected … great!!! Thanks Chris. Who else has been baking curd tarts I’m wondering – you?. They look great – love the idea of chocolate pastry, and your circus sounds like fun! Thanks C, they were delicious and the circus was excellent. Is this a bit like a Bakewell Pudding? No idea what a Bakewell pudding is Scott, but if it’s anything like a Bakewell tart, it’s got to be a good thing. But this isn’t anything like a Bakewell tart. My boyfriend is from Yorkshire and we’ve just spent the weekend up there, which involved, amongst lots of other eating, curd tarts which were delicious. I like the idea of incorporating some chocolate into them too – yum! Oh how lovely. I’m so very tempted to go to Yorkshire specifically to do a curd tart tour! Have you had or are you going to have a go at making some? i’m not a massive fan of this kind of set custard thing but I can totally see the appeal, plus the chocolate pastry is stunning… great Yorkshire representation too, my mum used to love these as a kid! Oh is your mum a Yorkshire lass Dom? It’s so strange the things we don’t like – CT who will eat virtually anything that is put in front of him can’t stand semolina – weird! they look gorgeous. I tried a jamie Oliver ‘quick Portuguese custard tart’ thing out of 30 Minute Meals the other week – he just used creme fraiche and an egg as the filling based, and it worked quite well, but I bet these are just heavenly! I’ve heard so much about Portuguese custard tarts and really want to try one to see what all the fuss is about, but it’s very hard to imagine they could beat a curd tart. I can see creme fraiche and an egg would make a nice filling though. Oh I haven’t been to Yorkshire for ages but used to hiking near Howarth and visit the Bronte museum. I’ve heard of the legendary Betties but never visited. I’ve heard of these curd tarts too they look amazing.I’m a big custard fan my mum used to make the best ones ever. These ones look and sound amazing though as did your picnic and animal free circus..
Hope you win the £50! Hiking near Howarth sounds really exciting – striding around imagining oneself as one of the Brontes. I’ve never been, which is pretty shocking really, given I’m such a fan. Trying a Betty’s curd tart is just one of those things it’s good to do – just so you know what everyone else has been going on about. I expect they wouldn’t be as good as your mum’s though – homemade is invariably best I find. I’ve had a look at your curd tart Jenny – more than once it would seem: It looks really good. I never tried Yorkshire curd tarts. It sounds good traditional British food. I like the idea of ​​using a chocolate pastry! Ahhh, now these do bring back some very happy and tasty memories for four years spent in York! What a delicious twist too on such a classic…and thank you so much for entering these perfect picnic pies into TTT! these little cakes are delicious. I have never had them and they look interesting. I have to admit I’ve never had the pleasure of a Yorkshire Curd Tart but your post has me reaching for the ingredients!! I’m dropping by via TTT. Wow, these look like a lot of work, but sure looks very delicious.